Advice from an award-winning marketer. You’ve read it, heard about it on the news and from your friends and co-workers… That Polycarbonate bottle that you love so much is possibly leaching a chemical called Bisphenol A, into your body. While there is no solid evidence that it is actually happening to you, you have to admit, it gives you a very uneasy feeling knowing that the words “chemical” and “your body” are never good when placed in the same sentence. As you stand above your recycle bin, ready to drop your beloved bottle in with the newspapers, aluminum cans and those Evian plastic bottles that you secretly put your lips to when you mistakenly forgot your favorite bottle at home… You suddenly remember that you gave out this same bottle at the company picnic, to all of your employees and customers! Yikes! If your company has used Polycarbonate Bottles in your past marketing or internal efforts, you know first hand how much your customers and employees love your bottle! Now you find out that your bottle might just be doing more than you bargained for and you’re wishing you could go take them back. While it is smart to avoid any future exposure to BPA, the good news is that you can still utilize water bottles in your marketing efforts! After all, they are one of the best promotional products out there with one of the highest ROI’s for the money! Well now there is a better solution, one that will build your relationship with your customers, brand your company’s good name and let them know how much you care for their health and their business. The solution… BPA Free Polycarbonate Bottles! They are here and in high demand! There are tons of colors and styles to choose from, but stock availability is in question because the demand is so high. They are made from various safer plastics that are manufactured without the use of Bisphenol A and have been determined safe by the FDA. The bottom recycle code number is the key to knowing if your bottles or the bottles you are looking to purchase, are safe. According to the Institute of Agriculture and Trade Policy, the safe numbers are 1, 2, 4 & 5. A simple way to remember it is this… Use 4, 5, 1, & 2. All the rest aren’t good for you! Bottles with the number “7” are the bottles that pose the most concern and have sparked the BPA debate. So why not take a possible negative situation and make it a positive marketing effort that will strengthen your relationships with your employees, your customers and your prospects, building goodwill and appreciation for your brand. No matter what company you choose to work with for your next order, make sure they are knowledgeable in the BPA controversy so that they can make sure to guide you to solutions that are truly BPA Free. Proforma Big Dog Branding can show you many options in BPA Free bottles. Call us today for an e-mailed presentation of BPA Free Bottles. For more consumer knowledge on the topic of BPA, please visit this link for an article from the Institute of Agriculture and Trade Policy. Chris Morrissey is the Owner of Proforma Big Dog Branding, a premier provider of promotional products, printing services, ecommerce websites and eco-friendly marketing solutions. To reach Chris: chris@bigdogbranding.com; http://www.bigdogbranding.com/. 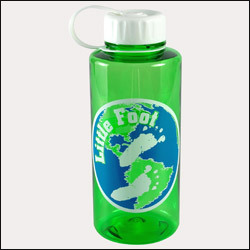 Promotional water bottles have the potential to drive leads and business to any company. It makes easy to promote your company name, logo and company information. Thanks for the valuable update hope to see the next update soon.